You are here: Home / Damp / Rising damp in Yorkshire’s post war housing is often caused by construction defects and… rationing! Quite a statement and one I may get taken up on. However, I find that in the majority of cases, where these relatively new houses have rising damp, there’s nothing wrong with the original DPC. In saying that I do sometimes recommend installation of a new one, depending on the circumstance. Here’s why. Often these houses had the potential for rising damp built-in from the start. 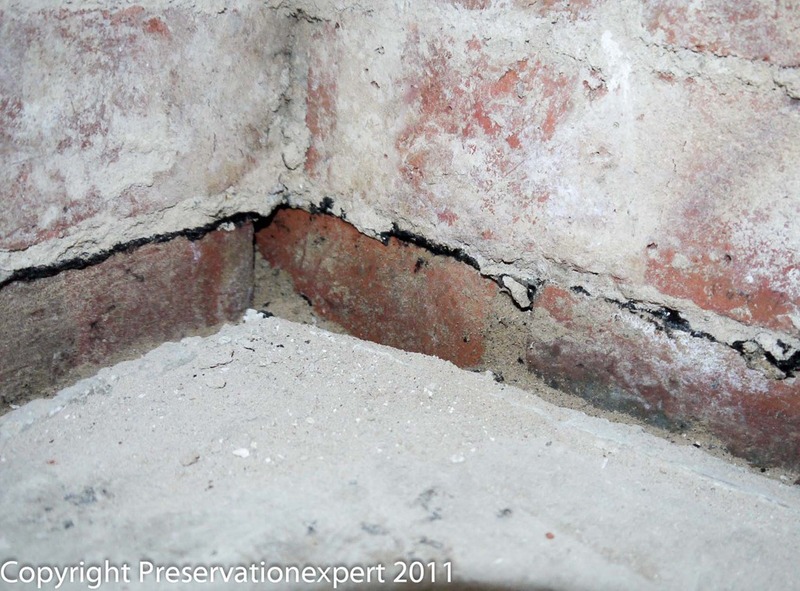 They all have traditional bitumen damp proof courses and at only 60 or 70 years old, these should be working. The thing is though, after the war traditional building materials were in short supply. Timber in particular was hard to come by. You can see this when you enter the houses. There’s often a increase in the use of solid concrete floors and the joinery is of small section; deep moulded skirting’s and architraves disappear and tiny plain bull-nosed and chamfered items come in. I see this all over Leeds and the rest of Yorkshire. Surprisingly, even this change impacts on the results of my damp survey, a few decades later. As an example I’ve included a survey from this week; North Leeds in West Yorkshire, a damp survey for a home buyer. The house has solid floors and cavity walls. 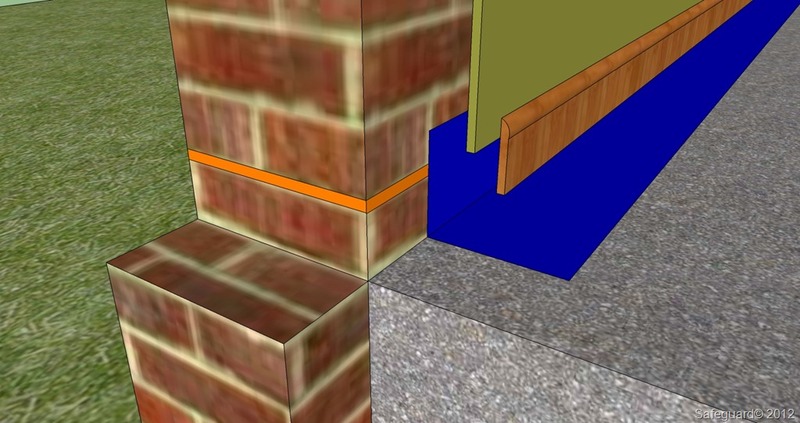 The solid floors lack a DPM, but the bitumen DPC is there, visible in the external brickwork. Symptoms of damp include perished and salting plaster (lime based), on many of the walls including internal dividing walls, party walls and the inner skin of the external cavity wall. Profiling with my protimeter MMS in conductivity mode reveals a nice rising damp profile to match the damage. 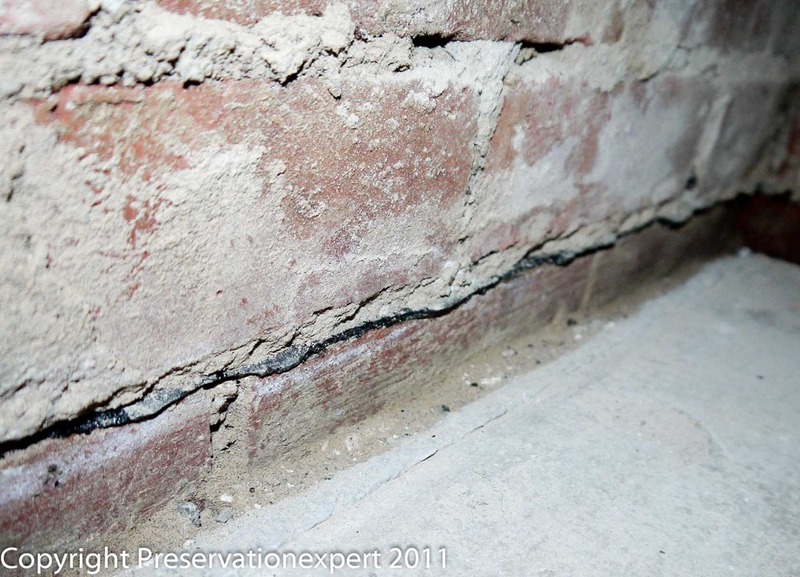 However, the rising damp is only there to a height of around 150 to 250mm above the small section skirting. It is much higher on the chimney breast piers though, at around 700mm or so. It allows the damp strip along the floor/wall junction intimate contact with the rear of the skirting boards. Whilst the DPC is well bridged, some of the capillaries available for continued passage of damp are broken at the interface between the plaster and the brick. The wood absorbs some damp too and when you think about it, at only 15 to 20mm thick the ‘bridgehead’ if you will, is much smaller than the area of the base of a wall is, had it no effective DPC. Not surprisingly the rising damp though damaging, is maintained at a low level. Salts are still concentrated in the evaporation zone and the lime plaster has failed as a direct result. The skirting harbours wet rot and wood boring weevils are breeding there too. Remember, the floors have no effective damp proof membrane below them, so they will remain moist. Why not break them up and replace with a membrane and modern insulation? That would be a great idea and would allow a nice sealed waterproof joint at the DPC level too. However, the existing floors are generally level and true. There’s no signs of sulphate attack, cracking or even any salting. Can we save the client some money? It will cost many thousands of pounds to replace all the floors. Oh and another thing – some of the floors were laid after the walls were plastered, so the lime plaster is embedded in the concrete in places and so are some of the door frames and such. Let’s forget I am a damp specialist for the moment and think. What damage has this done? You could just re-plaster and replace the skirting. That is one option. The problem may re-occur but hey, it took decades for the damage we see now to become a big issue. It’s an option. As a specialist I want to leave the building and know, that a re-occurrence is either decades away, or will never happen. Rake out a chase (water proofers sometimes call this a reglet, but it is only extending into the floor, not into the wall), around the wall/floor junction and clean it all the way up to the DPC (about 50mm high). Remove the lime plaster from the chase; it’s too friable and soft to seal effectively. The above has solved the bridging issue and the client can have the walls plastered and fit new skirting too. 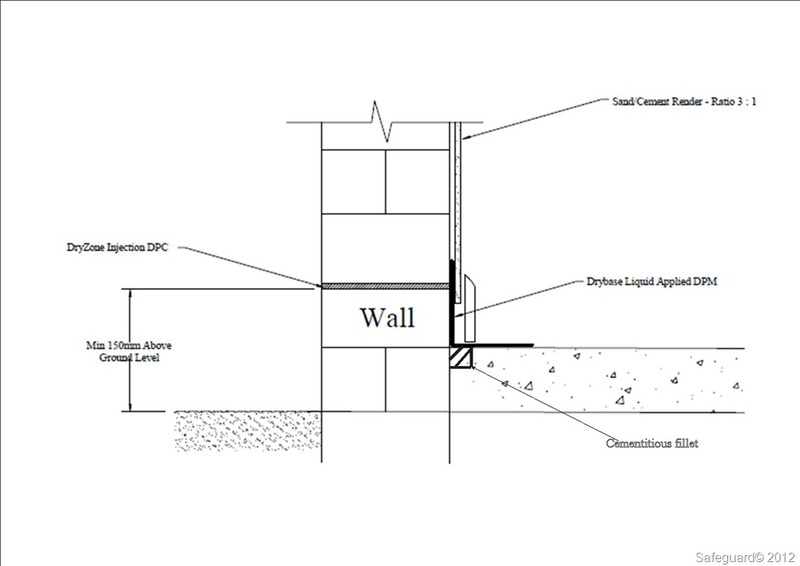 Dry line the walls so that the lightweight modern (or lime based traditional) finishes are completely insulated from contact with contaminated brickwork and bed-joints. 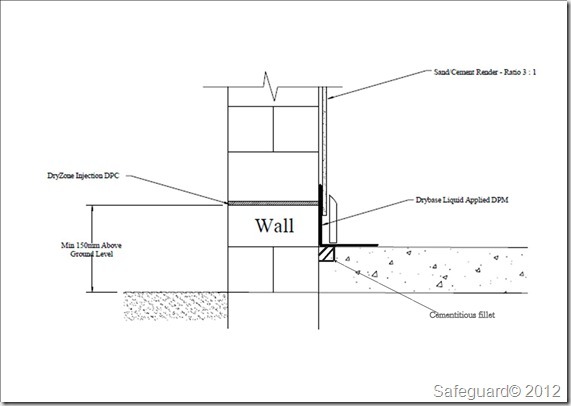 In this case the client has chosen a render, which let’s face it, is much cheaper, especially as the damage is confined to a narrow strip around each room and ‘patching’ a dry-lining is a none-starter. Despite the evidence of my eyes and my experience I cannot know whether the bitumen DPC is in perfect condition can I? The DPC is clearly bridged and we are going to fix that. But, is all the damp due to the bridging? 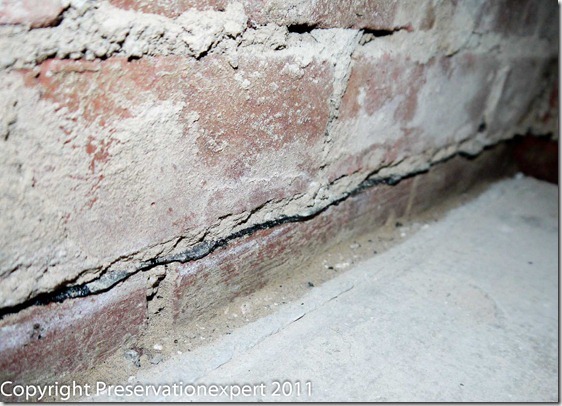 Could some be due to small breaks in the DPC or a lack of a DPC in places? It’s clear that there is no DPC in the chimney breast piers. They are to be exposed and the hearths ripped out as part of the buyers plans. So I am installing a Dry Zone chemical DPC in these piers. They are very salty too, so the render needs extending, though as they are salty high up, a dry-lining option is recommended here, instead of the render. The rest of the property is quandary though. Costs so far are quite high; The Chasing work, hacking off, floor/wall sealing, plastering skirting and waste disposal. Every room is effected so that’s quite a lot of disruption. So I’ve given my client the option of installing Dry Zone DPC into the rest of the walls, just above the old one. Modest cost and there as an insurance against having to do anything in the future if there is a break anywhere or if in a few decades the bitumen finally gives up the ghost. 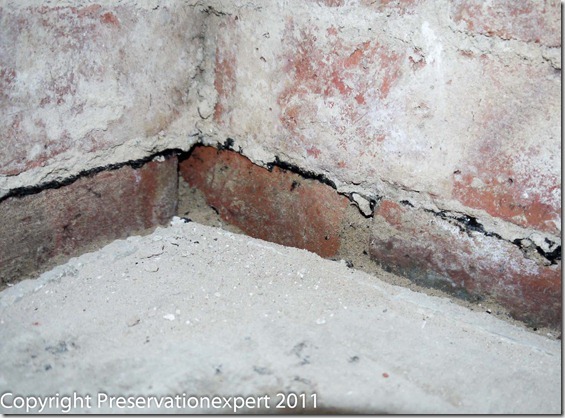 Rising damp – it’s not always straightforward. However by taking the time and trouble to get to the cause and explain the situation to the client so he/she can make an informed decision, we have a solution which should meet the customers needs. It’s tough on clients when the problem appears relatively small but the extent of the solution means costs escalate. Good job they called a pro who won’t cut corners! Past events over christmas put me off the net for a bit but I’m back on form now and have a few new posts in mind. I’m chuffed you have joined the blogosphere too – well done. Great blog. Just a couple of quick questions. What is the purpose of cutting a chase around the perimeter of the floor? Also, what kind of product would you apply to the floor and if the condition of the floor is reasonable enough, would this provide a long term solution? ie, would you expect the floor to remain in a decent condition, even with a membrane applied on top? If you look at the photo you will see that in this case the original lime plaster extended below floor level, so it had to be raked out to get a good bead of mortar there. If the floor was sound it would just need a good scour with a chisel to remove any shred of plaster and get a nice clean base. Reglets and fillets are only normaly needed when we have hydrostatic pressure, such as in on a basement waterproofing job. Above ground you don’t need one really. This property is a post war house with no DPM below the floor. if the concrete is sound, there’s no need to break it up unless the client wants the insulation installing below it. The upper surface can be ‘sealed’ using either a latex type liqiud DPC (adequate but not suitable for any wear and must be protected), or a more durable epoxy coat, though in a domstic environment it doesn’t need to be a very high performance coat like a garage or industruial unit would need. Good domestic products include DryBase and Safeguard ECS.